FFM: China and it's plans for the U.S.
China and it's plans for the U.S. Prior to 1840 China looked at itself as the center of civilization with no desire to conquer other nations. From 1840 until the 1940's China was basically a colony of other nations and this was disgraceful from their perspective. They are determined to never have it happen again. Per the BBC presently the U.S. has 11 aircraft carriers and China has one. The United States has half the military power in the world. Historically China's world influence was more economic than militarily. For these reasons many believe China is not interested in colonization. This is the background leading to the creation and implementation of a long range plan for China to regain it's power and influence. The western world needs to wake up. China may not be interested in conquering the rest of the world, but surely they want to be in a position of influence and strength so they will be able to wield "soft power" backed by military and economic might. 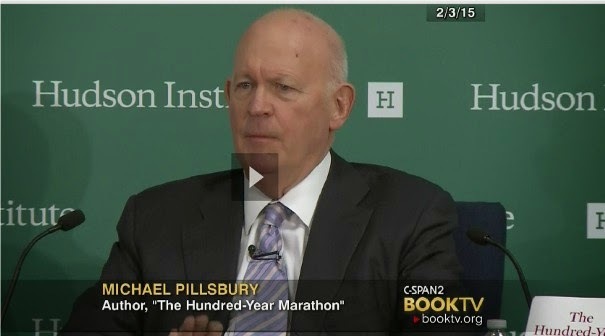 I watched a video on C-Span reviewing the book "Hundred-Year Marathon" The author discusses China's plan to be the world power both economically and militarily by the year 2049, which is only 35 years away. Per the book this plan was developed and implemented by Chairman Mao in 1949. This not so secret secret plan is well on its way to being accomplished . Their economy has already past ours and by 2049 China is projecting that their Gross Domestic Product will be three times the size of the GDP of the U.S. What can we do about it? Our options include 1) attack them now while we still have a chance, 2) step up our efforts to make them more like us by democratizing them and, 3) create stronger ties with other nations in the world so that our combined united forces will be economically and militarily stronger than China and their allies. All three options come with costs. We must make a decision soon for time is running out. The largest obstacle in addressing this issue is our ability to focus and develop a comprehensive plan putting us in the best position possible and implement it in a methodical and practical manner as possible. While China continues to implement their plan for the next 35 years our leaders are focused on the next election in 2016. After that our leaders will spend their time strategizing on the elections of 2018 and 2020 and tearing the other party down. The focus is not on how we retain our world leadership position, but what each party needs to do to either retain power or gain power. Focusing on what is right for the country presently is only a secondary issue. If we don't change we lose. We must demand our leaders lead. We need to work on strategies that democratize China. The focus of this effort needs to be on the people of China and not that country's leadership. At the same time we must recognize we cannot compete and win against China without allies who are true partners. China is too large geographically and politically. We need strong partners who are strong allies. It starts with Great Britain, the European Union, Japan, South Korea, Canada and goes from there. We need to get closer to India, the country having a population about the size of China's. Africa and South America also need more attention. Frankly it is a disgrace how we neglect South America and Africa. We need to step up our investment in these countries. To do so means Americans will need to consume less. We all know how much we enjoy consuming. If we are to win this competition with China we will need to make sacrifices in the short term for the long term. China is counting on us to be like the drug addict. We need our fix now. They believe we have gotten soft with the good life and we are not willing to make the necessary sacrifices to win over new allies and keep the allies we already have. I am not sure whether I would be willing to make that bet myself. I will be dead by 2049 but my sons will not. I hope at that time they are sitting around and laughing at what a worry wart I was. We have always been short sighted in our thinking. Over the past decade this has gotten worse because of Citizens United. Money in this country rules politics. As a result doing what is best for the country takes a back seat to doing what is right for large donors. For us to meet the challenge of China we as a country must be willing to invest more in our allies, present and future, and consume less. Can we do it? From my generation, baby boomers, on we have been spoiled. After World War II we were the last industrialized country standing and we have gotten short-sighted. The question is can we step up and meet the challange. It is our turn to man up and look beyond today. It means reducing our standard of living for the future's sake. China is betting we cannot do it. The response to this post has been overwhelming. Thanks for helping a good guy who happens to be good at his trade.